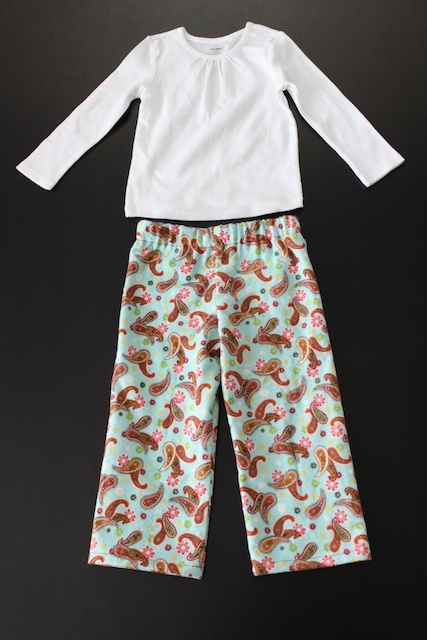 This last Christmas I made pajama pants for my girls. I found the fleece fabric at JoAnn and thought they would be cute for some warm and comfy pajama pants. 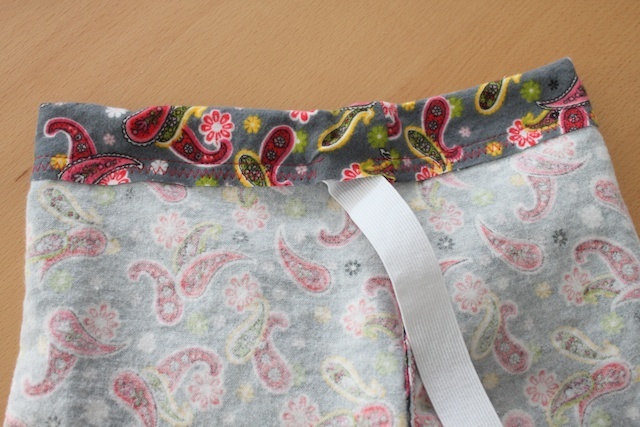 My sewing friend, Emily, showed me the easiest way to sew pajama pants. It seriously saved me so much time by doing it this way. And since Kaye, my 4-year-old, has the same size waist as a 12-month-old, I was able to adjust the waist size to fit her perfectly. If you make something inspired by Simply Modern Mom, please upload pictures of it to our Flickr group to show it off to everyone. You may be featured on Simply Modern Mom. 1. 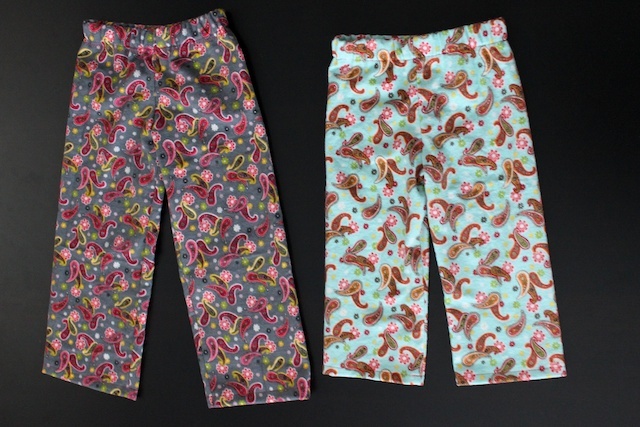 Grab a pair of your child’s favorite pants and turn them inside out. Preferably another pair of pajama pants or sweats. Then tuck one leg inside the other. 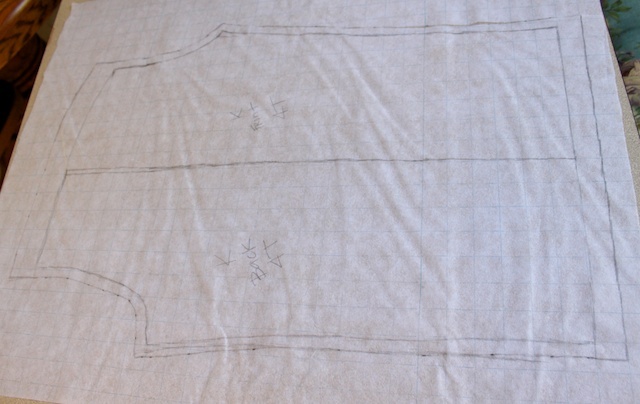 Place on top of the pattern ease or large butcher paper to sketch the pattern. Pants are usually made up of 4 pieces – 2 front pieces and 2 back pieces. 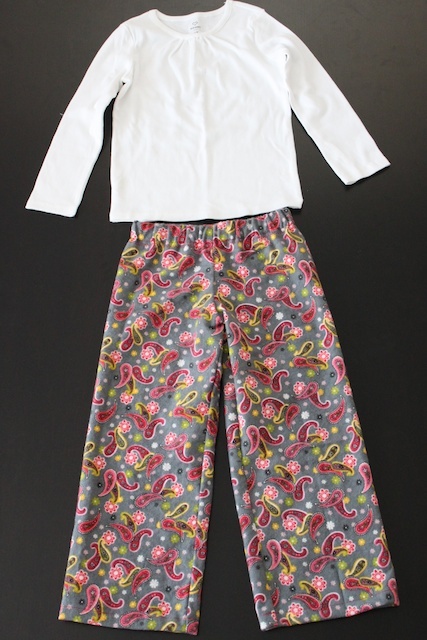 However, since these are simple pants, you will be drawing one pattern piece where you will only need 2 cut pieces of it. 2. I started out with the back piece of the pants, it’s different than the front piece. See the tag sticking out in the picture. 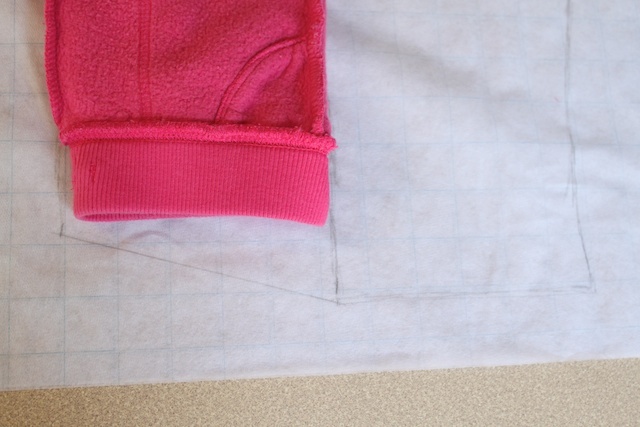 Make sure the pants is folded at the seam to get an accurate drawing of the pattern piece. Trace the pant pattern with the straight leg seam facing inside the pattern. Leave some room around the pattern to draw the seam allowance later. 3. With the pants still turned wrong side out, flip the pants over to sketch the front pattern piece. Now you will match the straight leg of the front piece to the straight leg of the back piece that you just sketched. Label it to help you remember. 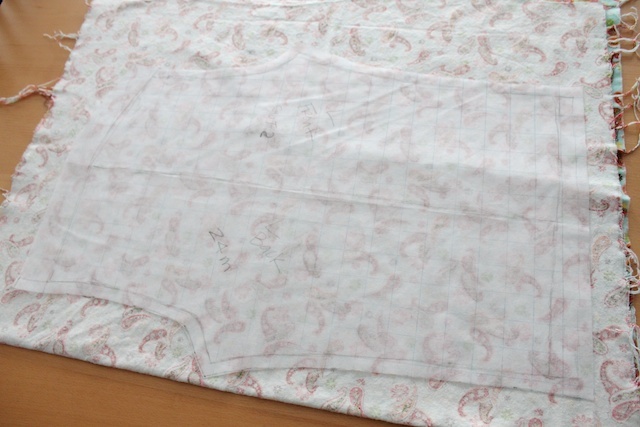 This is where you combine the front and the back piece pattern into just one pattern to save you sewing time. Just to make sure, the curve for the crotch in the front and back are on either sides of the pattern with the straight leg in the middle of the pattern. 4. To draw the waist portion, stretch out the elastic waist band a bit so that it gathers when you place your elastic. Plus it gives some stretch room to pull the pants up and down. The waist portion stretched out will be about the same width or slightly wider than the rest of the pant leg. And the waist of the front piece may be shorter than the back piece. Mark the difference then draw a line from the top of the back piece wait line to the top of the front piece waist line. This line will be at an angle down. Or to keep it simple, match the waistline of the front (shorter) piece to the top of the back (longer) piece so the waistline is the same for both pieces. 5. 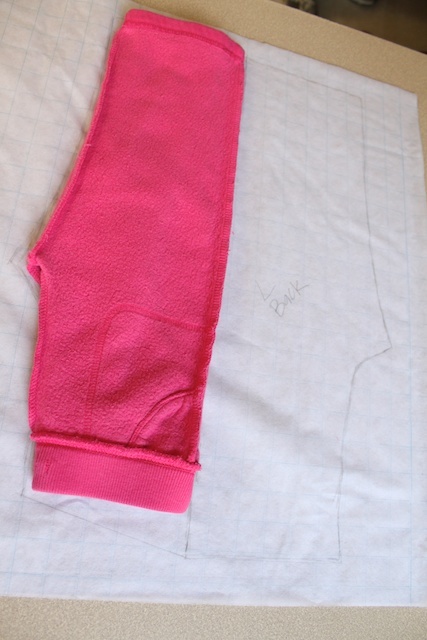 Now add 1/2-inch seam allowance around the pants. I usually do a 1-inch at the bottom hem. It’s easier to hem the pants shorter than to make it longer if your pattern came out a bit short. Plus it gives them some growing room. And then consider the casing of the pants. How wide is your elastic? Mine was 3/4-inch wide. Take the width of your elastic x 2 for the fold over + 1/4 inch for some room + 1/2 inch for the seam allowance = your casing at the waist. So I added an additional 1 1/2 inch at the top for the casing since I already had an inch from the pant pattern’s waistband. 6. Cut out your pattern, including the seam allowance. Then trace onto your fabric. You will need two pieces of this pattern, one for the left leg and one for the right. So I folded my fabric in half, trace the pattern and cut both pieces out at the same time. 7. With the right sides together, match the inner straight leg to the point of the crotch curve. Pin and sew the two separate pieces. I did a straight stitch then a zig zag in the seam allowance. If you have a serger, you can serge the seam allowance. The top curve won’t match up and that’s OK. It’s not supposed to match up (see picture below). 8. 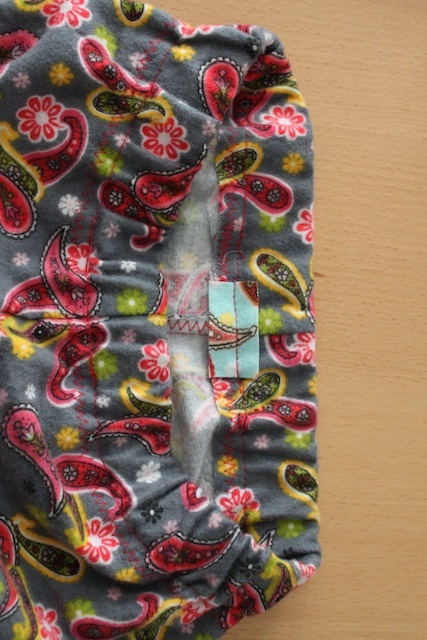 Once you sew the inner leg portion of the pants, flip one of the legs right side out. Tuck the pant leg that’s right side out inside the wrong side out pant leg with the crotch part lined up. The two pant legs should have the right sides touching. 9. Pin the curves together and sew one big U that’s the curve. This is the curve that’s from the crotch to the top of the waist. 10. Pull out the other pant leg and you have an almost finished pair of pants. 11. 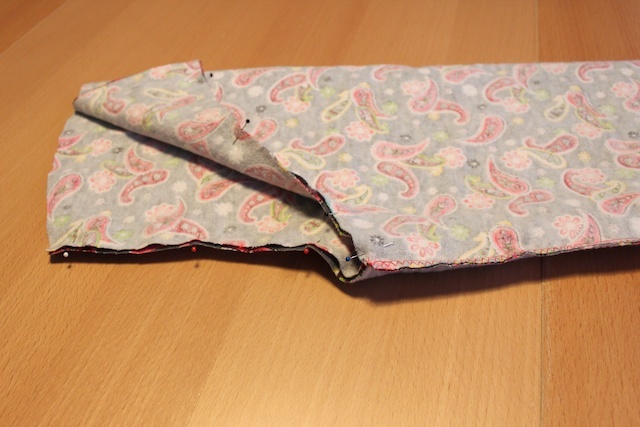 Fold down the casing for your elastic at the waist. Sew it in place but leave an opening to pull the elastic through. 12. 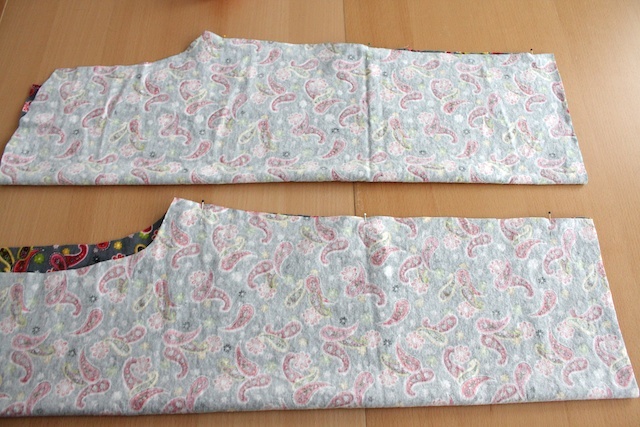 The elastic is the length of your child’s waist measurement + 1/2 inch for sewing the end together. 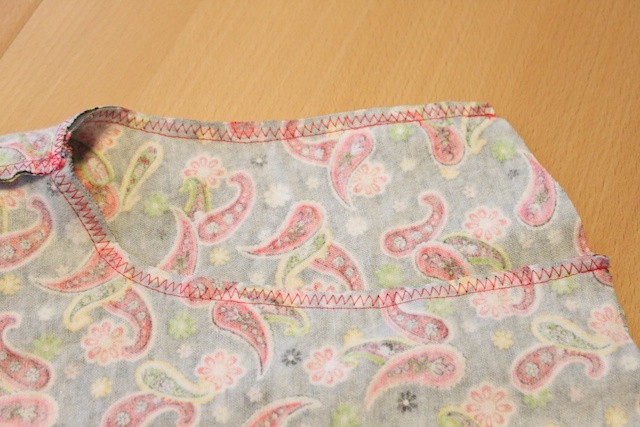 Pin a large safety pin at one end of the elastic and use it to help pull the elastic through the waistband. 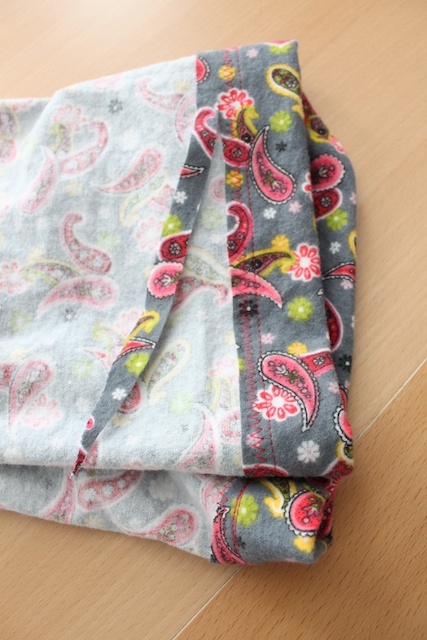 Then sew the elastic ends together. 13. You may have excess seam allowance at the waist. You can trim that off to make it even after you sewed the elastic casing. 14. Sew the opening close. I added a little tag at the back so my kids can easily identify which is the front and which is the back when putting it on. 15. Have child try the pants on to see how much to hem at the bottom of each pant leg. And done! 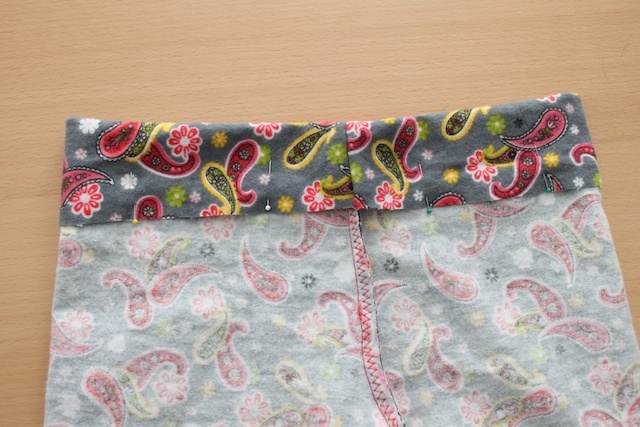 » Have you made pajama bottoms before? How did you make them? I am a novice sewer, or should I say non-existent!! I tried your tutorial and was happily surprised to see a pair of pants when all was said and done!! Thank you for posting!! Thanks, in two hours I made two pair and I think I will make me some too. Thanks so much for posting this tutorial. 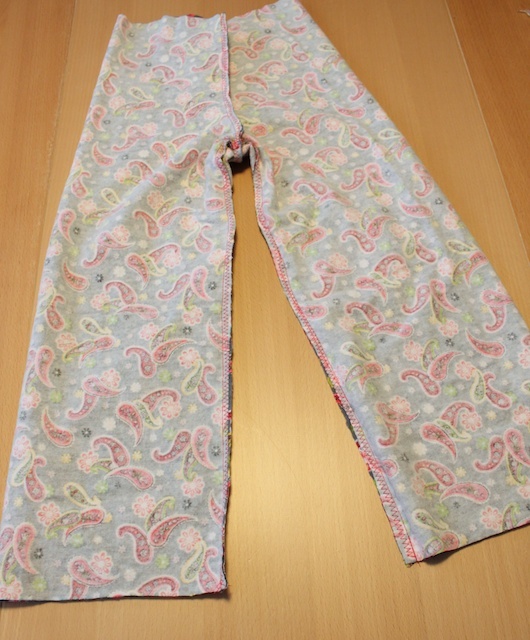 My daughter is having hip surgery in a few weeks, and I needed to learn how to make some pants that will work with her spica cast. I am a complete novice, and this project was easy enough that I whipped up two pair while my little guy napped. My next step will be opening the sides and adding Velcro, so they can be slipped on a bit like a diaper, but I wanted to try the basic pant first to see if I could even do it. I can! This is great! Within an hour I had a lovely new pair of lounge bottoms for my toddler! Thanks for posting! Loved this easy tutorial. I just made some Batman pants for my 2yo and they turned out perfect! I didn’t have to rip a single seam! Hi, I’m a newer comment, and also new sewer, your tutorial is really great I love it, think I would begin sewing with this project and hope I will do it better than you describe. I like the way you describe step by step and you make it easy to realise. Thank you very much for sharing with us. I’d like to have this pattern but any way, I’ll try to do it for me and my 2 daughters. I am a beginner sewist at best! Actually, this is the second clothing item I have sewn. Wanted to make my son some PJ bottoms for Christmas. I did that last year, but with A LOT of help from a friend, so I don’t think that really counts. I gave it a go on my own this year using my Nanny’s ancient sewing machine – seriously, it’s older than I am!! I came up with a super cute and easy pair of pj pants and learned some valuable lessons here, such as; buy enough fabric to ensure your pattern goes in the right direction (it would probably help to know what you are doing with said fabric prior to purchase), ALWAYS, stretch the waistband when making your own pattern (I’m pretty sure you said this, so also ALWAYS read and re-read the instructions/tutorial! LOL), and lastly, don’t sew the crotch together, it makes the pants hard to put on!! LOL!! I think next time I make these it will go much better and I WILL be making them again. 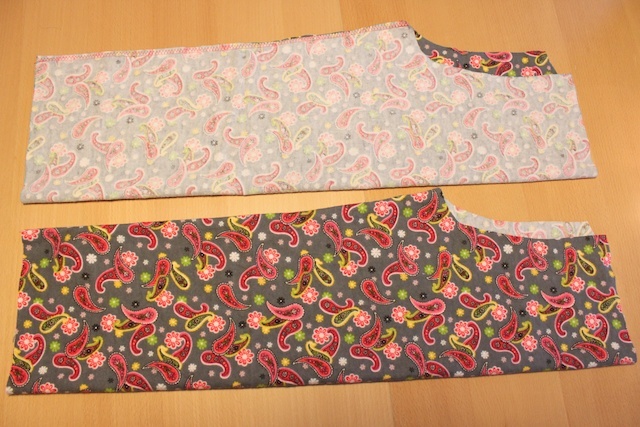 Very soon in fact, because the waist is so small on the ones I made I don’t think they will fit my boy for long!!! HA HA!! Thank you for the clear instructions and lovely pictures. I am new to sewing but have lots of fervor.so I have bookmarked this site and will do some PJs for the kids.Got to find some material. If you can’t figure out how much fabric you need for any size just look for a comparable commercial pattern on the internet and look at the back of the envelope view. 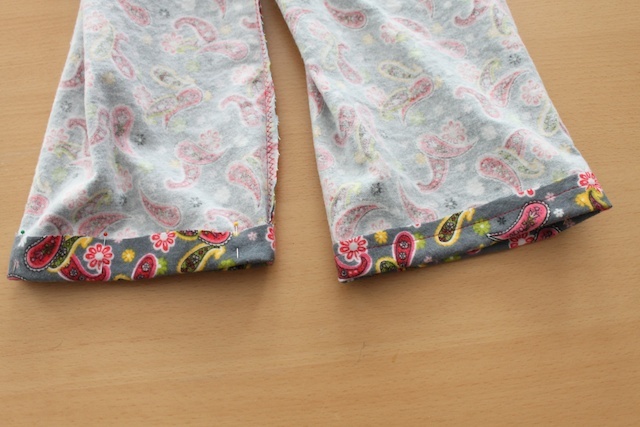 This method can be done for casual pants as well using different fabric, and shorts for summer as well. I was getting frustrated with my pant pattern for my kiddos and came across yours. Tried it immediately and love it. Fits great everytime! Thanks! Thanks so much for sharing this pattern! I’m going to pin it so I can find it again easily to share! I just made a pair of shorts for my son using your pattern techniques and it was so much more accurate than some other tutorials out there. Thanks again for sharing! This is so straight forward–I’m so excited to try it! I pinned it too! 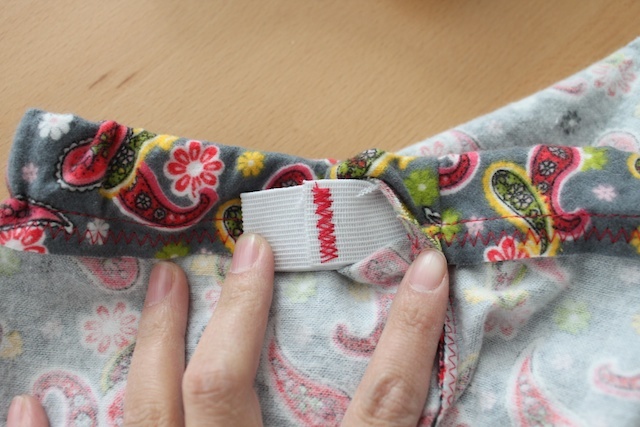 Great tip about the little tag sewn in the back for knowing which side is front/back! Great tutorial – thanks! 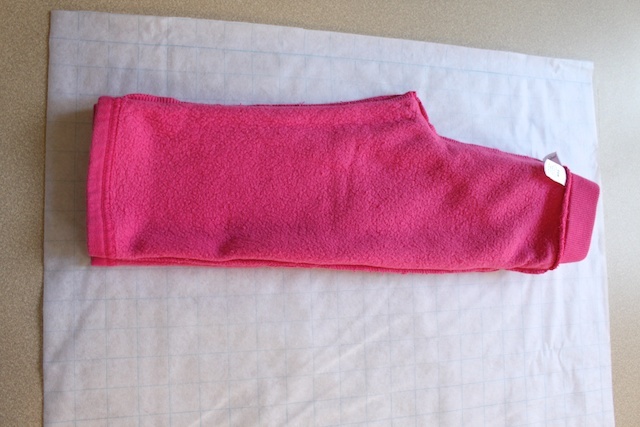 I made some pants for my little girl’s Barbie doll the other day and had quite a struggle when i had to turn the one leg into the other one – they are so small!! Absolutely wonderful tutorial–thank you! It was so clear and easy-to-follow, that I made a pair for my daughter and matching pants for two of her dolls in one rainy afternoon. Thank you! Thanks for the tutorial it was great! I appreciate the time you sent with it! I’m excited to make these nannies for my kids this Christmas! Now, the fun part shopping for the fabric! Awesome job, Mrs. Simply Modern Mom!!!! Four thumbs up!!!! This was my first big sewing project (other than taking in shorts or pants for my daughter) and it was a huge success. Her new pajama pants are adorable and fit great! Thanks for the clear directions and helpful pictures! I am going to make these for my baby nephew. I saw cute monkey prints at Joanne’s. he is five months old so I will make a blankie is to go with the pants.